So, those of you reading this column from the west coast of North America, take a moment to look straight down. As of this writing, *Legion* is in Dubai, United Arab Emirates, which has a twelve hour time difference from the Pacific Time Zone. Be sure to wave. Philadelphia 14 - Detroit 45: Jim Bob Cooter! If you didn't know his name by Thanksgiving, you did afterwards considering how many times they repeated his full name, like it's a requirement or something. Carolina 33 - Dallas 14: Bringing back Tony Romo then was totally worth it, according to Jerry Jones. Oh well, at least he got out of taking the Christmas decorations out of attic this year. Note to self: become quarterback of the Dallas Cowboys so I don't have to do that again. Or go with *Legion* to Dubai. Chicago 17 - Green Bay 13: Bit of a scare with Aaron Rodgers, which probably caused more than a number of people to hurl curses at their televisions after Thanksgiving dinner. Imagine if you were starting Aaron Rodgers and Tony Romo was your back-up in fantasy. That ain't indigestion from the turkey you'd be feeling; that's the feeling of watching your season almost imploding in back-to-back games. Oakland 24 - Tennessee 21: It almost feels like the Raiders are improving but you can almost say the same thing about the Titans. I mean, who would have thought Oakland's log would be part of the "In the Hunt" graphics for playoff seeding? Buffalo 22 - Kansas City 30: Travis Kelce Dance Party. I think everyone should dance when they score a touchdown, regardless of ability in order to prove what ESPN's Robert Flores claimed and what pretty much everyone else was thinking. Tampa Bay 12 - Indianapolis 25: I'd love to be Matt Hasselbeck at his age. I'd hate to be Chuck Pagano at his age. New York Giants 14 - Washington 20: So Odell Beckham, Jr. is now a spokesperson for Head & Shoulders and yet his famous catches don't involve his head or shoulders at all. Missed opportunity there, David Tyree. New Orleans 6 - Houston 24: Bad enough the Saints are in the same division as the perfect Panthers, but compounding the problem is that their defense appears to be dead even without Rob Ryan running it and they can't keep praying Drew Brees keeps putting up near single game records. Minnesota 20 - Atlanta 10: Adrian Peterson's back and the Falcons are still the Falcons. St. Louis 7 - WKRP in Cincinnati 31: I heartily recommend checking out the full episode on Hulu, the clip from which I posted last week in the thread. The build-up makes the payoff even better. San Diego 31 - Jacksonville 25: You know, Blake Bortles, only the audience at home can see the blue line on the field. Miami 20 - New York Jets 38: Maybe Ryan Fitzpatrick should endorse beard trimmers, since he groomed his famed facial hair prior to this win. Arizona 19 - San Francisco 13: So the ref crew hilariously botched something early in the game and were punished for it. By being taken off the Sunday night game so that they can ruin someone else's game. It's time for the NFL to get with the rest of the American sports world and make the officials full time employees with appropriate compensation. But of course they won't since these mishaps aren't enough to threaten the status quo to promote a change. Pittsburgh 30 - Seattle 39: Again, this game and the fallout since proves that the player cannot be trusted to self diagnose injuries. Then again, after last week's debacle with the Rams, you probably can't trust the sideline staff, either. Or the league people in the booth. You know what, just listen to the screaming fans and the people yelling at their TVs; they all seem to be better neurosurgeons by comparison. New England 24 - Denver 30: Brockweiler! Brocky Mountain High! Brocky Top! Better get used to the random nicknames until Chris Berman officially weighs in. Baltimore 33 - Cleveland 27: I'm sure the sports fans and citizens of Cleveland are wonderful people, but who in the hell did they piss off to be cursed so badly? Jacksonville vs. Tennessee: Hey look, we get to watch *Legion* and Gumbie pull their hair out again. Question, how does one watch football in Dubai? At the local Round Table? Hopefully for the Jaguars' sake, someone told Blake Bortles if you do a three step drop, taking five steps forward is going to get flagged. Jacksonville. Indianapolis vs. Pittsburgh: Injuries to key players seem to be the story of the last few weeks and of these teams in particular. Question is which team either has the depth to overcome it or has enough healthy starters to make up for it. In this case...Pittsburgh. Enjoy the week, folks. And pop by your local Last Honest Pizza for *Legion*'s sake. Vector is this week's resident of Perfection Island, just slightly east of whatever island people are blowing up in the lastest Just Cause game. I am the top Canadian! Rat Boy, might want to link to the pick'em site. Not even the top guy in BC =p Pork and I are both over in Victoria. I hate all of you! Get out of my birth city! I don't think I can watch football this week after the cluster-f*ck that ended the Browns game last week. Do we at least get the No. 1 overall pic? Do we at least get to choose whose career we are inevitably going to ruin? Jacksonville Jaguars at Tennessee Titans: It's a real shame they aren't wearing the same uniforms as a couple weeks ago, because . . . you know, I can't even joke. Worst. Uniforms. Ever. Houston Texans at Buffalo Bills: It's cold, it's Brian Hoyer, also, it's Brian Hoyer. I don't notably trust Tyrod Taylor to be anything other than really boom or really bust, but Hoyer gonna Hoyer. Baltimore Ravens at Miami Dolphins: Listen, I'm really sorry, Browns fans, but that was an amazingly entertaining game the other night. San Francisco 49ers at Chicago Bears: Blaine Gabbert is having the best stretch of his career. This is not necessarily a compliment. Indianapolis Colts at Pittsburgh Steelers: Is Ben playing? Hell if I know. I'm just guessing Pittsburgh's defensive scheme will be slightly better than Tampa's "Hey, let's just not cover Moncrief on third down" approach last week. Who the heck is PorkSmoothie89?? Rumor has it Coldplay is headlining the Super Bowl halftime show. They must be a forward looking thinker with a name like that. Oh great.. Jim Bob Cooter is back on TV. Am I wrong that GB and Detroit have played 3 games in 11 days? Player Safety Yo! Bad form not linking from last week's thread, Rat Boy. I took care of it for you. Some of us are lazy and only look at recent posts and must be accommodated. So... should GB still R-E-L-A-X down 17-0 to the Lions? Hooboy that was a phantom pass interference call if I've ever seen one. 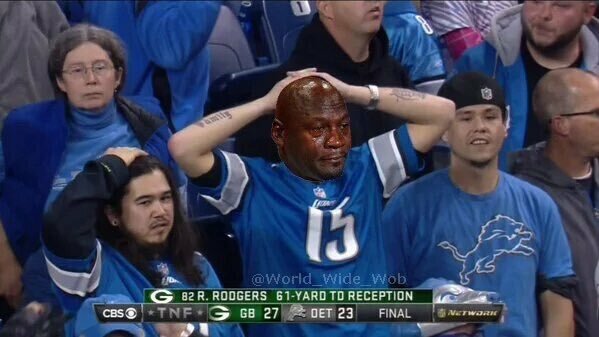 So... should GB still R-E-L-A-X down 17-0 to the Lions? :? I may be on Dubai time in spirit. Facemask penalty, untimed down, hail mary. Wow. That would have been the most Lions way ever to lose a game if he had actually grabbed the face mask. Instead, they just got mega screwed over. Oh sure, the ref who had the clear line of sight to Rodgers didn't throw the flag but the one standing behind him and only seeing the turn of the head did throw it. I suppose after those losses at CenturyLink, Rodgers is due for one to go his way. NFL thinks that Packers will bring in more $$ in the playoffs. What, just because both current wild card teams in the NFC have a win they didn't deserve because of botched calls at the end of games against the Lions? The National Football League is a grotesque, profit-driven circus, but don’t be fooled — as players, our eyes are wide open. Written by Eben Britton, ex-Jaguar.